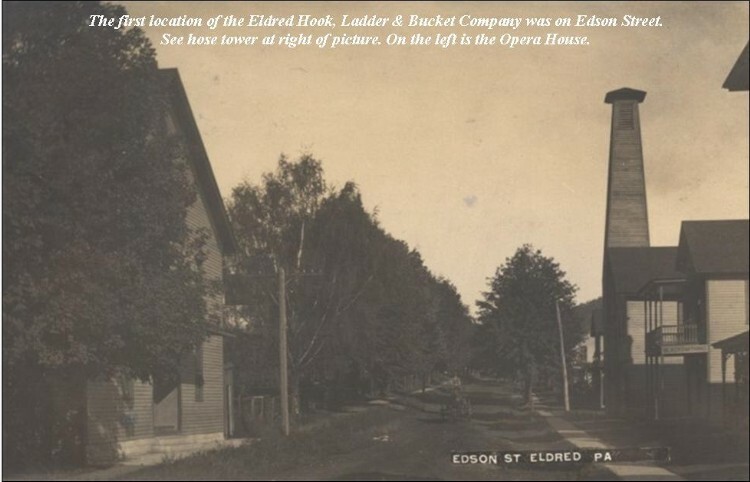 The Eldred Hook, Ladder & Bucket Company was organized in April 1879. The first officers were: C. C. Moses, President; C. B. Jackson, Vice-President; W. G. Robarts, Secretary; John Reedy, Engineer; William Geist and F. Parsons, Foremen; A. T. Barden, C. B. Jackson, E. W. Doane, A. D. Gould and E. R. Mayo, Managing Committee. In June 1879 a second fire company was organized with C. M. Wagner as Engineer. Both were reorganized and combined at one unit in May 1883. The new unit was not much more than a parade unit and was a strong rivalry with the Go-Devil Hook & Ladder Company of Duke Centre. Eldred had at this time a population of 1,165 (242 families) and had been incorporated into a borough on December 22, 1880. The rapid growth of Eldred resulted in safety being disregarded for hastily built structures lining both sides of main street. Together with plank side walks, main street was separated by only 40 feet. There were in Eldred at that time in 1880: 14 grocery, 3 millinery, 3 dry goods and 3 clothing stores. In addition one bank, six laundries, nine doctors and one newspaper office. Late in the evening of September 30, 1881, the fire bell was rang. Flames were reported coming from the Jackson Opera House on the corner of Edson and Main Streets. A kerosene lamp was found responsible for a fire that would all but destroy both sides of Eldred's Main streets that night. The fire spread in both directions and jumped across the street in a wild spectacle. There was no modern fire protection of any kind, except for the buckets and water from wells. A telegraph call was placed to Olean for help and a steam powered water pump was sent by rail to assist, but this was too late. The great fire of 1881 burned over five acres of structures on both sides of the Main Street and was only stopped by courageous men with buckets and a vacant lot sitting between the fire and more buildings. All the buildings on the west side of Main Street were rebuilt eleven feet farther back, providing a wider street and protection zone. The fire devastation resulted in the construction of a 500-barrel tank on Chrisman hill and three-inch pipeline down through the business portion of town. A hook and ladder cart plus a hand drawn hose cart were purchased. T. L. Sartwell was the first chief of the new fire department equipment. The next major fire happened on September 17, 1884, when the St. Elmo Hotel owned by B. W. Rice burned. A large Newfoundland dog named 'Ol Heck would save many lives that night by awakening the sleeping guests. Unfortunately 'Ol Heck would become trapped and perished in the fire. His death was mourned by the Eldred townsfolk who had recognized the valiant and heroic effort of 'Ol Heck. With the oil discovery and producing in the region a new and dangerous industry would come to the Eldred area - nitroglycerin. On January 3, 1885 the George H. Dana glycerin factory on Windfall road exploded, taking the lives of J. Simmons and a young boy C. Thompson. On February 17,1887, the Alford & Dean glycerin factory had three tons of dynamite explode. The Eldred Water Works was completed in 1890. The year 1892 would see six major fires in town. On April 28, 1892, the Coleman Hotel would once again burn, taking the life of the owner C. M. Coleman. He died while attempting to secure valuables and a roll of money ws found grasped in his charred hands. The cause of these fires was contributed to arson and the culprit was run out of town. 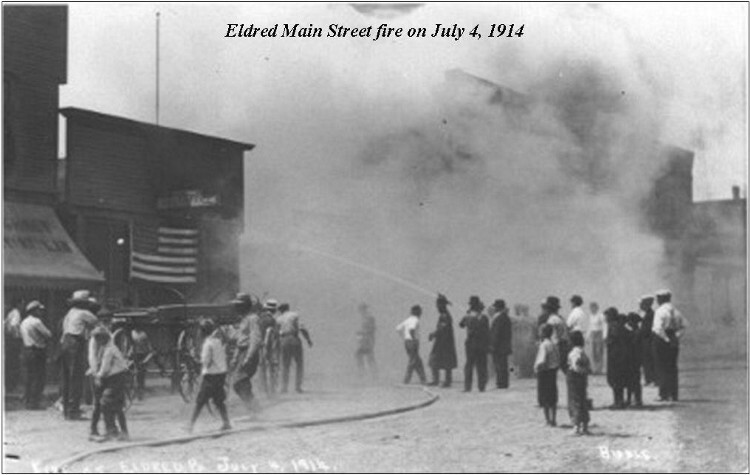 The townsfolk of Eldred figured they had the right man since only one fire was recorded in 1893. Lumber mills around Eldred would claim millions of feet of raw lumber destroyed by fire. The largest fire was the J. J. Newman's mill in Larabee on October 21, 1899. Over three million board feet of cut lumber was destroyed and losses were $24,000. The Eldred Powder Company in Bullis Mills exploded in 1906 claiming the life of Charles Brown. New industry would come to Eldred around the turn of the century with glass production. The Eldred Window Glass factory was built near Mechanic Street (present location is Park Avenue) and the Kervin Glass Factory located on Bennett Street (present location is the elementary school). The Kervin factory burned in the winter of 1914. In 1916, the Indian Creek School was destroyed by fire and rebuilt at a cost of $680. On January 19, 1921, the handle factory of C. Prouty & Company was destroyed by fire with an estimated loss of $75,000. The Prouty company had no fire insurance. 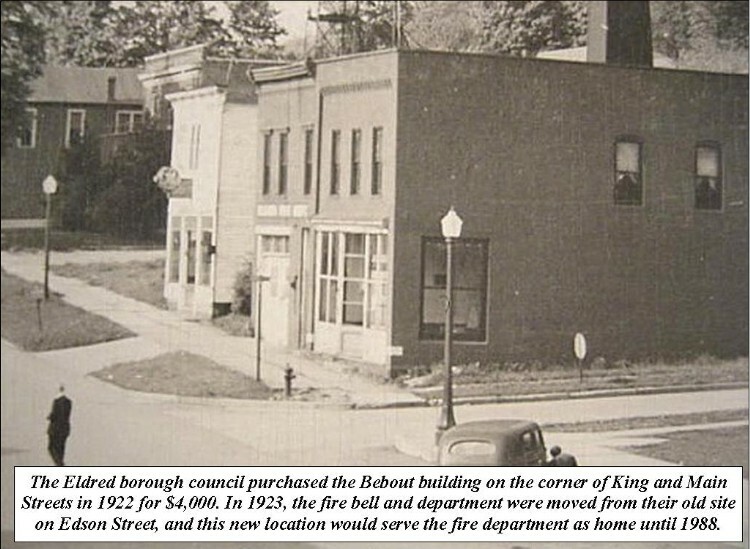 In 1923 the Borough Council selected L. L. Russell as fire chief. He was in charge of the buckets, ladders, two hand-wheeled hose carts and was paid $5 for leading the scene of each fire. From 1923 to 1929, a Model-T Chemical & Acid apparatus was purchased and used to fight fires. In 1926, there were 35 active members of the fire department. In 1930, a new Buffalo Fire Apparatus truck and chassis for the chemical truck were purchased. In 1937, the fire department reported over 100 members. In April 1938, the Eldred Fire Department became a charter member of the Tri-County Fire Association with members Layton Howell and Kenneth Slavin as delegates. In 1939, an explosion at the National Powder Company took the lives of three workers. During World War II the fire department conducted Civil Defense programs and was salvage collection committee. In March of 1943, Bill Frampton was elected Quartermaster and to assemble the fire department Drum & Bugle Corps equipment: 4 snare drums, 2 bass drums, 2 tenor drums, 1 set of symbols, 6 tenor bugles, 2 brass bugles and the color guard with rifles. The Drum & Bugle Corps shared these musical instruments with the Eldred High School band and the corps would later dissolve from a lack of interest, along with the marching unit. In December 1944, Francis 'Spike' Slavin was elected by the department as chief only to be opposed by the Borough Council and Burgess Shields. Spike attempted to resign as the newly elected chief only to have this rejected by the department. The fire department turned out in force to protest the council decision and the council backed down and accepted Spike Slavin as the newly elected fire chief. He would serve 10 years as chief of the department. In 1950, a tragic explosion at the National Powder Company shakes the entire town and kills seven workers. 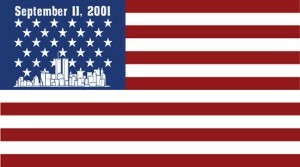 The explosion rattled buildings as far away as Portville, NY. 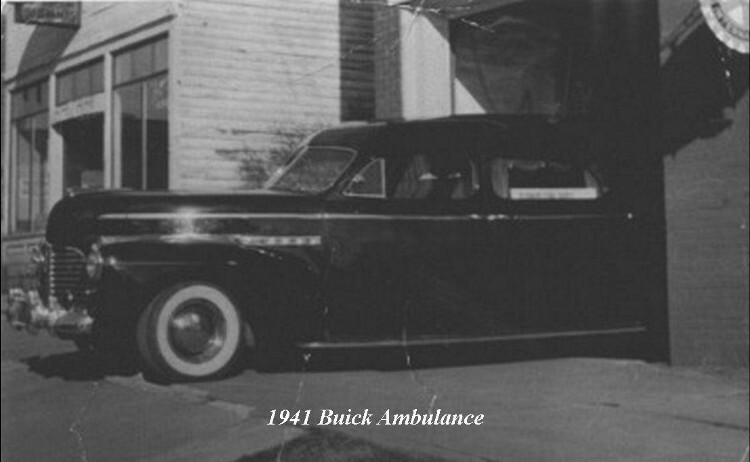 Also in 1950 the Eldred Volunteer Ambulance Association was formed and purchased a 1941 Buick hearse/ambulance for $2,100 in Syracuse, NY. Today the department utilizes two modern equipped ambulances and has several EMTs on the force. Political differences between Eldred Borough and Eldred Township governments over fire taxes resulted in the township wanting to build their own fire department. 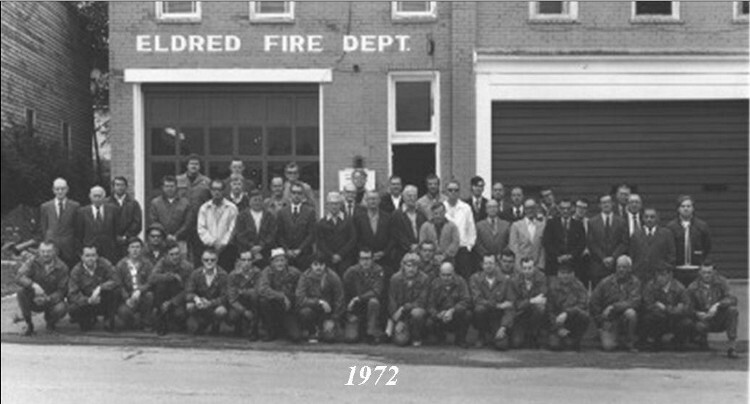 In 1962, the Eldred Township Volunteer Fire Department was organized and George Stroup elected first fire chief. 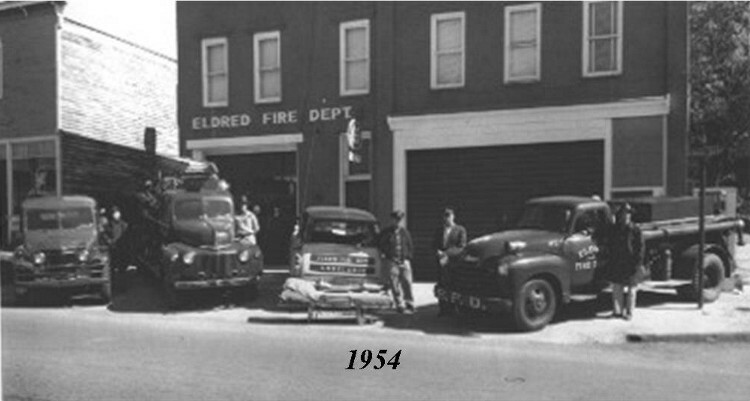 From this time onward the Eldred Fire Department became the Eldred Borough Volunteer Fire Department servicing the borough and areas of Ceres Township along McCrea Brook, Barden Brook and upper Sartwell. In 1968 another large explosion rocks the Joyce National Powder Company outside town rattling buildings and breaking windows several miles in all directions. In 1987 construction began along property on Platt Street for the new fire department and social hall. The fire department moved in 1988 to the new location which was only a few yards from their very first location on Edson Street. In July 1995 the Walker Machine Shop (originally Platts Cutlery) burned to the ground only feet from the fire department. 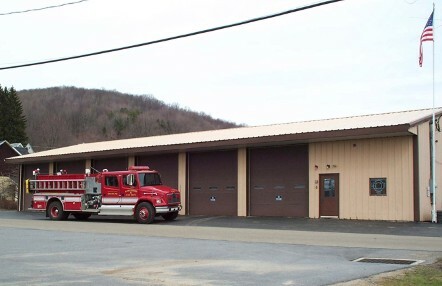 This property eventually became an enlarged parking lot for the fire department and recently the former Penelec building opposite the fire department was purchased and used to store equipment, chief's office and training rooms. In July 2009 the annex building burned from an electrical fire that also destroyed our two ambulances. In October 2009 a fire heavily damaged the social room and men's room of our main station. The fire was ruled arson and the person was arrested and facing charges.